Ride across the Colorado prairie! The El Paso County Wagon Train is a two day annual event in coordination with the El Paso County Fair that runs almost entirely across the open ranch land of eastern Colorado. 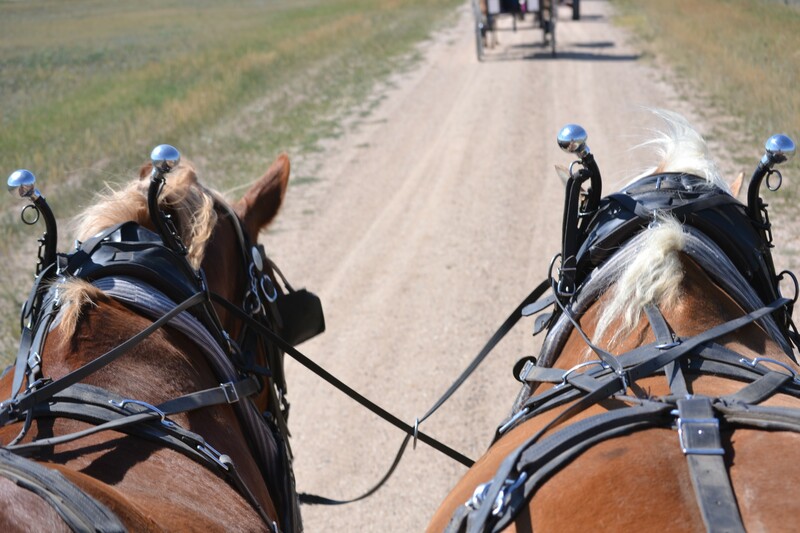 The trail ride is a two day event, with a short three hour round trip ride on Saturday and a five hour wagon train ride starting from Ramah State Wildlife Area on Sunday. Trail ride participants may arrive on Friday to camp out before the ride, arrive Saturday morning for a short and easy ride of around three hours if they choose, or wait to arrive Saturday evening or Sunday morning. Participants may choose to only ride on Saturday for three hours, on Sunday for a five hour ride, or choose to ride three hours on Saturday and five hours on Sunday. Your registration includes breakfast (doughnuts, coffee) and dinner on Saturday and breakfast and lunch on Sunday (you will need to provide your own lunch on Saturday). Saturday's dinner will also include musical entertainment and dancing. Every wagon that participates on both the Saturday and Sunday drives will get $100 to cover expenses. In 1988, Alf Owens, the El Paso County Fair Manager for many years, Secretary Mary Richardson, and Board Members Junior Hall and Dale Lucore, were looking for ideas to promote the El Paso County Fair. The Rock Island Railroad train stopped at the Lucore Ranch in Peyton, CO with the county officials and other supporters for a branding of calves in the arena by the railroad track. BBQ was brought in by Jean Gaddy for 4-H member, families and friends. The next year, 1989, was the first authentic wagon train pulled by work teams of either horses, or mules rolling across the prairie. Rubber wheeled wagons were forbidden. It started out at Latigo Ranch, North of Falcon, CO with 26 wagons and 75 riders. We crossed the 4 Way Ranch known as Bob Lee's, then on to the Dawson Ranch north of Peyton, CO. It was hard to make 25 miles in one day so we stayed over-night there in wagons and tents under the trees. Teams were tied on picket lines with wranglers to watch over them during the night. That night we had a BBQ with over 200 people, a dance, and several different entertainments. Sunday morning after breakfast and Cowboy Church, we started off toward Calhan, CO to kick off the El Paso County Fair. We arrived at the Rodeo Arena in the afternoon. The wagon train continued for 10 more years under all kinds of weather conditions, with almost the same route. We always had different entertainment through the years. Channel 11 did filming and KCS radio station interviewed as Indians attacked the wagon train and several other things happening on the trail. In 1998, the Wagon Master retired and the wagon train discontinued the ride. In 2007, there were several parties interested in starting up the wagon train again. It was hard to find enough vintage wagons so the rules were changed to accept rubber tired wagons. That summer, we started from the fairgrounds to the Paint Mines and back to the fairgrounds, completing 10 miles to kick off the El Paso County Fair. Since 2008, Don Bailey from Bailey Ranch, one mile north of Simla, CO provided a starting point coming across the Eastern Plains to the El Paso County Fairgrounds to promote the Fair. On the first Saturday, we do a half day ride with lunch down on the Big Sandy. Once we return to the Bailey Ranch, the horses can be put in corrals or an outdoor arena until Sunday morning. You are then able to relax and take a tour of the Bailey Saddle Museum that has over 300 collectible saddles, bridles and antique cars. Sunday morning we start off with breakfast put on by Good Luck Sam's, Cowboy Church and then get ready to start the 19 mile ride across the prairie to Calhan, CO. Around noon we take a lunch break at Ramah Dam, in Ramah, CO. then continue our ride to the El Paso County Fairgrounds. No passing others at a gallop. Pass another rider/wagon only after notifying that rider/wagon. Proceed at a reasonable, safe pace. Out of respect for the people participating in the Sunday morning church service, we request that you keep the noise in the proximity to a minimum.